Bus from Johor Bahru to Seremban is the most common transportation option for travelling from Johor Bahru to Seremban. The reason is that there is no airport in the state of Negeri Sembilan where Seremban is located, thus taking a flight is not suitable. Train service is available to connect passengers from Johor Bahru to Seremban, but due to the lack of upgrading in the train system, the duration from Johor Bahru to Seremban by train is taking too long. 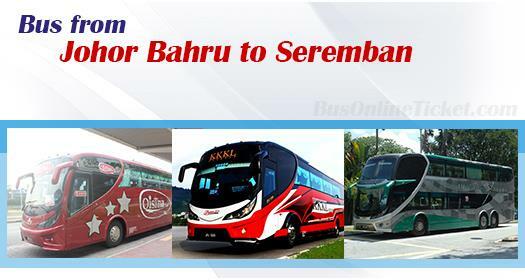 Therefore, bus from Johor Bahru to Seremban is the favourite choice for passengers. The duration for a bus from Johor Bahru to Seremban usually takes about 3 hours. Most coaches will go directly to Seremban without stopping at a highway resting area unless a washroom break is requested from the driver. The standard bus fare for bus from Johor Bahru to Seremban ranges from RM 28.00 to RM 35.00. Please note that the bus fare would go up slightly during festive seasons like Chinese New Year and Hari Raya. All coaches from Johor Bahru to Seremban depart from Larkin Bus Terminal and terminate at Seremban Bus Terminal One. The terminal is located at Seremban city centre, where passengers can easily connect to any other places in Seremban. There are numbers of bus operators providing the bus service from Johor Bahru to Seremban. Some passengers may be confused by the available choices and are wondering which coach to take. Here are some suggestions, based on our survey from local passengers’ preferences. Most locals prefer the brands of KKKL and Plusliner. The reason is that their coaches are always punctual, clean and comfortable. On top of that, both KKKL and Plusliner provide many departure schedules for passengers to choose from. Apart from the two operators, S&S International and Starmart also provide buses from Johor Bahru to Seremban. Furthermore, bus agent UBT Group also offers coaches that depart from Taman Universiti in Johor Bahru. Even though there are multiple coach choices and departure schedules from Johor Bahru to Seremban to choose from, passengers are advised to purchase Johor Bahru to Seremban bus ticket online at BusOnlineTicket.com instead of making a last-minute ticket purchase at the counter. This is because Johor Bahru to Seremban bus ticket may possibly be sold out even on weekdays, especially for the two famous brands mentioned above. Hence, passengers can avoid lengthy waiting time at Larkin Bus Terminal. Your booking with BusOnlineTicket.com is instantly confirmed.